Showing 20 articles from March 26, 2013. More than 100 attendees filled Toledo Middle School's lunchroom at the Big Town Meeting Thursday night, representing schools, businesses, lawmakers, retirees, and Cowlitz Tribe members, gathered to encourage and determine the town's future. A seven-year-old girl has been receiving death threats from another student at Winlock Miller Elementary School and administrators say they have yet to determine who the offender is. Parent Brandy Peppers told the Winlock School District Board Wednesday night her daughter Kiay began receiving threats "out of the blue" two months ago, despite Kiya’s tendency to keep to herself. The first threat stated, "I will kill you," and subsequent messages have been as violent and increasingly profane. Looking ahead to this year’s event, the Winlock Lions Club Egg Day Committee lays plans for the 77th Annual Egg Days. "The Great Eggscape" will be happening June 21, 22 and 23 in picturesque downtown Winlock, Wash. Come celebrate the hometown fun. Bring along family and friends to watch the parade, enjoy a free egg salad sandwich and explore one of Southwest Washington’s small town gems. Winlock placed first among small schools at the Southwest Washington Massed Choir Festival hosted in Onalaska March 19. Here’s wishing everyone a fine Easter holiday. The Community Dinner on Sunday will start at 2 p.m. in Community Hall. Fill out the sign-up sheet in Community Hall or call Sharon at (360) 353-8745 ASAP. The Social Club will supply baked ham, roast beef and beverages. Bring your own table service (or settle for paper/plastic) and a salad, side dish or dessert to share. Simon Plamondon was born April 1, 1800 at Francois Du Lac, District of 3-Rivers Province of Quebec, Canada, son of jean Baptiste and Catherine Gill Plamondon. He grew up on an island in the St. Lawrence River n ear Montreal. Abenaki Tribal records reveal that the Simon Plamondon family in Quebec carried a certain amount of Abenaki blood quantum; consequently, today’s descendants of Simon also have a percentage of Abenaki blood. Toledo New Life Assembly invites all children from toddlers to fifth grade to the 13th Annual Community Easter Egg Hunt Wednesday. This EGGstravaganza begins 6 p.m. at the church, 420 Silver St., where you receive a raffle ticket for a chance to win one of the prizes displayed. Groups will be dismissed by age for the egg hunt over at the middle school – tons of eggs! Please note: regularly-scheduled Wednesday Night Dinners will resume the following week. Increased BSNF traffic will commence for Amtrak Service from Seattle to Portland plus northbound coal cars if and when the shipping port north of Seattle is approved. This will mean an extra 25% rail traffic. At present, modifications to the tracks are under way. Make sure you have plenty of time for train crossings as some are 100-cars plus in length! More than ever, those living within one mile of the tracks should be aware of HAZMAT situations and how to handle them. Calling all local children for the Easter egg hunt coming up at the Winolequa Park! It’s scheduled for Saturday at 10 a.m. sharp. And when they say sharp, they mean all kids need to be ready by 10 a.m., because the hunt starts quick and ends quicker. The Winlock Community Club will be providing plenty of prizes for each age group, so be sure not to miss it! Floyd LaVern Voie Sr., of Winlock, passed away at his tome March 20, 2013, at the age of 84. He was born Oct. 21, 1928, in Amherst, Wis., and moved to Winlock at age 6. Floyd graduated in 1948 from Winlock High School, where he was football co-captain and recipient of the Otis Roundtree Inspiration Award. A high school job as a baker turned into his life-long career. He worked in commercial bakeries locally in Seattle, including Fuller’s, Safeway and Gal’s. During the 1960s he owned and operated the Winlock Bakery, and from 1989 to 1993 ran the bakery in Winlock Deli & Bakery. Henry Ammons Jr., a longtime resident of Winlock, passed away March 16, 2013, at his home. He was born June 11, 1948, in Longview, Wash., to Henry and Hazel Ammons. Henry graduated from Kelso High School in 1966. He learned to drive logging trucks in Northern California and continued his 40-year career in Southern Washington and Northern Oregon. He once drove his log truck in a car commercial, helping him to earn the nickname "Hollywood" from his truck-driving friends. A draft proposal to combine the municipal court services of Napavine, Winlock, Toledo and Vader was made available to each city last Wednesday. The proposal would centralize court services under Winlock, dissolving Napavine Municipal Court and terminating Toledo’s relationship with Lewis County Municipal Court. Vader currently contracts with Winlock for court services, so their arrangements would not change dramatically. 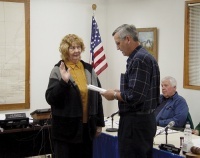 Vader Mayor Ken Smith (right) administers the oath of office March 19 to Linda Newton (Left), Vader’s newest City Council member. Newton was appointed by a 3-1 margin that night and has previously served as Sewer/Water Commissioner for the community of Skamokawa between 2003 and 2005. Council Member Kevin Flynn said Newton’s experience should help bolster Vader’s position during efforts to re-acquire their water system from Lewis County. 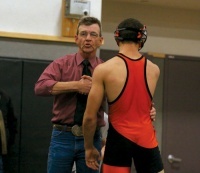 Toledo/Winlock/Onalaska Wrestling Head Coach Pat Jones has resigned after an eight-year career that ended with two State Championship titles during his last season. Originally a team of Winlock and Toledo students, Onalaska joined the program under Jones’ leadership in 2008 and participation swelled, with 18 students competing in the ’12-’13 season. Sunday was the first in a series of fund-raiser breakfasts at Toledo High School for their Track Team, with the goal of purchasing new uniforms for the students. 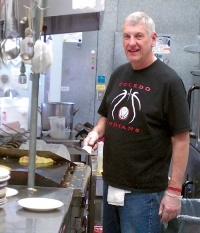 At the helm was Martin Huffman (pictured), flipping pancakes and making omelettes to order. $5 included coffee or orange juice, and the servers were able to practice sprinting back and forth to deliver orders to diners arriving after church. 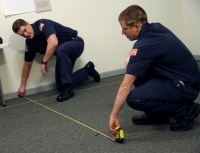 Cadets at the Winlock Police Reserve Academy were given the basics of crime scene investigation from Lewis County’s top detectives during their classes last week. Two sentences, one dismissal and four warrants were issued by Judge Steven Buzzard during Winlock Municipal Court Thursday. Jeremy J. Kelley, 27, of Toledo, is wanted by wanted by authorities in connection with an assault investigation. Family vacations and lengthy road trips are looking like much better ideas now that the days are longer and Spring Break is upon us. Though a tank of gas is no idle expense, driving remains a dependable method of travel, as long as your car is in good shape. Below are a few items to mark off your spring checklist to make sure your vehicle is in running order before taking a trip. As the spring days get warmer, it gets closer to time for the shearing of sheep. 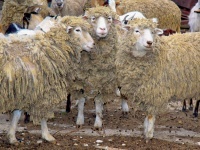 It is important to keep sheep shorn in time for summer--and any time their wool grows too large--as wool will continually grow and can become heavy, soiled and unhealthy otherwise.